Del Rey offers a large selection of cabinet knobs and pulls in designs ranging from contemporary to transitional to traditional. Our vast range of finishes ensure you achieve the final look you want, whether it’s crystal studded for maximum impact or a simple, clean look to blend seamlessly with your cabinetry. And don’t forget about adding a stylish touch to the doors in your home. Del Rey also carriers a selection of door hardware and handles. 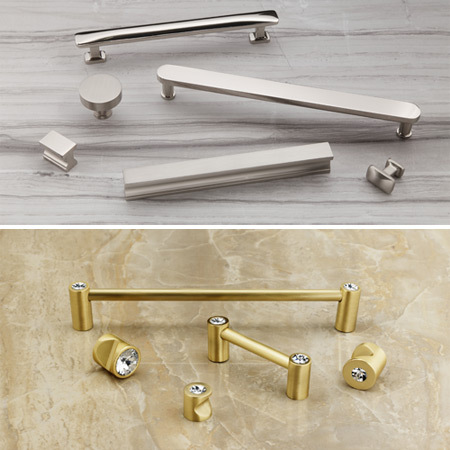 Del Rey displays a wide variety of decorative hardware in our showroom from high-end manufacturers such as Alno, Anne at Home, Atlas, Cal Crystal, Classic Brass, Colonial Bronze, D’Artefax, Edgar Berebi, Hafele, LB Brass, Modern Objects, Top Knobs, and The Tanners Craft.